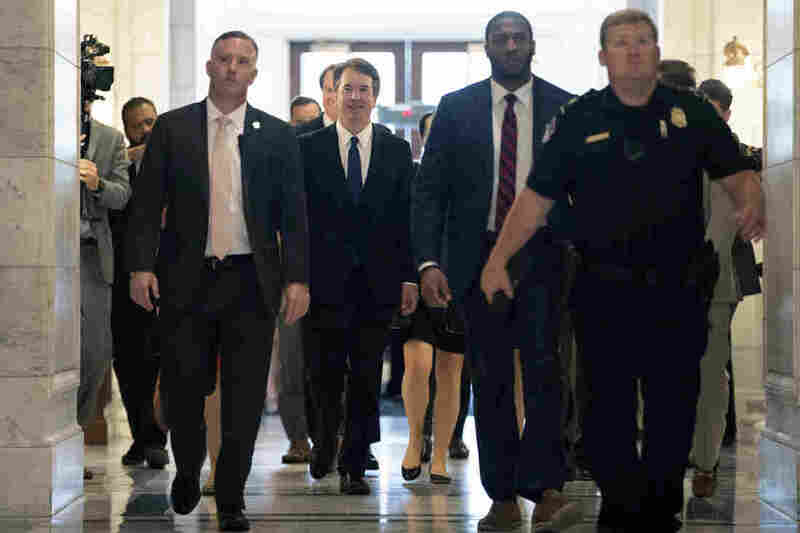 Kavanaugh Could Tip Supreme Court Against Gun Control Laws If confirmed, President Trump's Supreme Court nominee Brett Kavanaugh will likely steer the court toward broader gun rights. If confirmed, Judge Brett Kavanaugh could swing the Supreme Court further in favor of expanding access to guns and striking down gun control laws. "Kavanaugh's basically the roadblock to anything we want happening," said Charlie Mirsky, the 18-year-old political director of March for Our Lives. "We believe that if we got anything passed, he could declare it unconstitutional," he said. "He could just block anything we want from staying in place." Of course Kavanaugh could not do that by himself, but Second Amendment scholars on the right and left seem to agree where the nominee stands, and how important his nomination is in terms of gun regulation. "Kavanaugh believes in a very vigorous Second Amendment right to bear arms, and he thinks there is little room for constitutionally permissible gun control," says UCLA law professor Adam Winkler, who has written extensively about the right to bear arms. If confirmed, Kavanaugh would join a Supreme Court that has decided remarkably few cases involving gun rights. For most of the court's history, the justices said little about the Second Amendment, except to suggest that the right to bear arms was meant to apply to militias and weapons for military service. But in 2008, the court for the first time declared that the Second Amendment right to bear arms was meant to protect an individual's right to own a gun for self-defense in his home. The vote was 5-4, with Justice Anthony Kennedy casting the decisive fifth vote. The court's majority opinion was written by Justice Antonin Scalia, a gun enthusiast, but it included limiting language, explicitly endorsing some regulations as constitutional and citing as examples laws barring felons or those with a history of mental illness from owning guns, and laws banning guns from government buildings. It is widely believed that much of that limiting language was added at Kennedy's insistence. Now, however, Kennedy is retiring, and a Justice Kavanaugh would have a demonstrably less hospitable view of gun regulation. There is still a lot to decide. In 2008 the court, while suggesting that many regulations would be constitutional, declined to enumerate anything like a complete list. Instead, it took no position on assault-weapons bans, restrictions or bans on large ammunition magazines, on armor-piercing bullets, on laws that ban or restrict who may carry a gun in public. Indeed, the court did not even say whether it is constitutional to require gun registration or whether significant waiting periods for gun purchases are constitutional. Remarkably, in the 10 intervening years since that decision, the justices have not decided any of those issues. It's not that gun rights advocates haven't challenged all manner of gun regulations since then. They have. And every appeals court to have considered these issues has upheld these kinds of regulations, with conservative Republican judges taking positions similar to more liberal judges appointed by Democrats. Kavanaugh, however, has been an outlier. As he put it in a speech at the American Enterprise institute in 2016 on gun regulations, "I've been be a lonely voice." Indeed, on the U.S. Court of Appeals for the District of Columbia, Kavanaugh has staked out an unusually strong position in favor of gun rights. In 2011, he wrote a 52-page dissent from a decision that upheld a D.C. ban on "assault weapons" and magazines of more than 10 rounds of bullets, plus broad registration requirements. Tellingly, the two judges in the majority were conservatives, both appointed by Republican presidents. In his dissent, Kavanaugh argued that the Second Amendment, like the First Amendment guarantee of free speech, is a fundamental right that can be limited only in the narrowest of circumstances. "A ban on a class of arms is not an incidental regulation," he wrote. "It is equivalent to a ban on a category of speech." Moreover, as he put it, it is not for judges to weigh public safety in evaluating whether a gun law is constitutional. Rather, he maintained that because rapid-fire weapons "are in common use today," and "have not been traditionally banned," the Constitution does not allow that they be banned now. 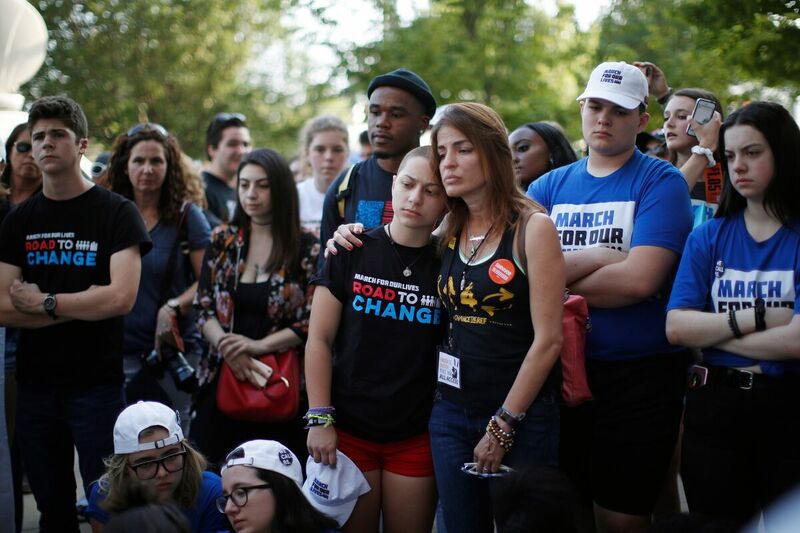 Anti-gun violence advocate and Marjory Stoneman Douglas High School shooting survivor Emma Gonzales, center, at a rally in Chicago in June. The students from the Parkland, Fla., school have become vocal anti-gun advocates, but a more conservative Supreme Court may stymie their efforts. According to Professor Winkler, "One of the things that's most worrisome to gun control advocates is that Judge Kavanaugh believes only longstanding gun restrictions are constitutionally permissible, which suggests that novel innovative ways to solve gun violence problems would not be acceptable in Judge Kavanaugh's view." Trevor Burrus, a research fellow and gun rights advocate at the libertarian Cato Institute, agrees, noting that Kavanaugh would likely supply the required four votes to hear challenges to many gun regulations. Until now, the court has apparently lacked the four votes needed to grant review of these cases, in all likelihood because Kennedy was not a sure vote. But Burrus and Winkler both see that changing now. Burrus sees Kavanaugh, plus Justices Clarence Thomas and Neil Gorsuch, as "the kind of gun-rights justices that you could reliably see striking down a bunch of regulations," including "10-day waiting periods, magazine restrictions, assault weapons bans, things like that." Burrus said, in his view, Justice Samuel Alito might be "a little bit less protective of gun rights," but would "still a reliable vote" in favor of gun rights. The unknown, Burrus and other experts agree, is whether Chief Justice Roberts would reliably provide the fifth vote to hold many gun regulations unconstitutional.